It was reported in the Washington Business Journal today that the stalled Engine 13 firehouse project may start site work in April. However, the project has changed course and instead of an office building, an as-yet unnamed “select service” hotel will be built on top of the new Engine 13 firehouse, planned for the corner of 4th and E Street. A sign has been up on the vacant lot since last year saying the project would deliver in the fourth quarter of 2013, but the new target completion date is the end of 2014. Back in 2011, marketing began for leasing the office space planned in the upper floors of the building. Since then, E Street Development changed their plans – perhaps due to the slowdown in office leasing activity in 2012, especially by the GSA? An office building is planned for the existing Engine 13 firehouse site at 555 E Street next door to the Consolidated Forensic Lab once the new firehouse is complete. 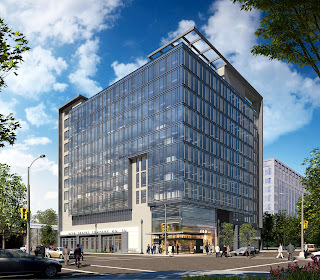 Previous rendering of 400 E Street office building/firehouse. E Street Development was selected by the District in 2009 with plans for the firehouse building to start construction in 2010. At one point, there was an effort to lure the headquarters of Northrop Grumman to the building, but ultimately the company chose to relocate to Fairfax County. 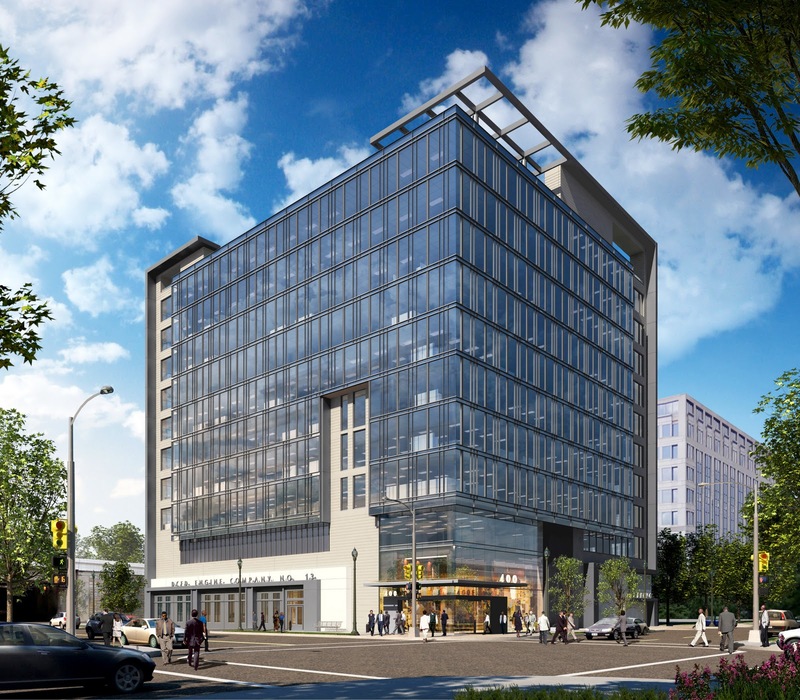 [E Street Development’s Geoff] Griffis said E Street will build window glazing and acoustical designs into the towers that will virtually eliminate noise generated by the highway and fire station. As an added precaution, the developers will create a signalized intersection at Fourth and E streets that the fire truck operators can control to stop all traffic and pull out onto the street safely when responding to emergency calls. "They should be able to go out, for at least a good portion of their calls, with just their lights blaring,” he said. E Street Development tells me that new renderings will soon be available for the project so I’ll post those once they are available. WDG Architecture is designing the buildings and Nelson Architects has designed the firehouse. Many will recall that E Street Development submitted plans to the city along with two other development groups and that the plans were vetted to the community in a presentation at the old Hogates building. There was even an informal poll on this very blog to choose the favorite plan. The city chose E Street Development for this project on the basis of those architectural plans and on the idea of office space as well as community benefits. Now at least two of those three elements have changed radically. Bait and switch on the community, or just a useless gesture to pay lip-service to get our neighbors enthused? Or a very premature effort to drag the community's interest through the ringer? This thing stinks any way you look at it.